Daiwa Capital Markets Europe Limited is the wholly- owned subsidiary of Daiwa Securities Group Inc., one of the largest brokerage and financial services groups in Japan. 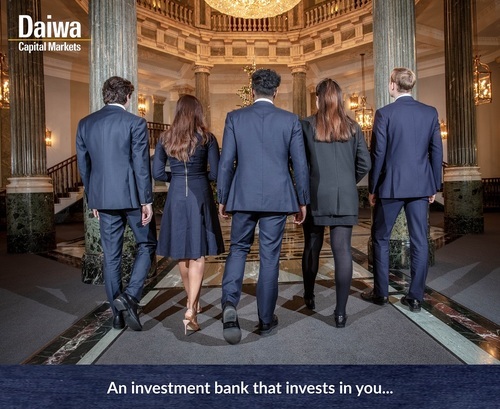 We are an award winning investment bank with a global presence, operating across Fixed Income, Equity, Convertible Bonds, Debt and Equity Capital Market business areas, whilst also expanding our reach into Principal Investments. We have a unique spirit and proud heritage where diversity and collaboration are key. The company is passionate about removing stereotypes, closing the gender pay gap, and increasing the representation of women in the financial industry, which is shown through our ongoing commitment to the Women in Finance Charter.Whilst all staff have accountability, we recognise that we are strongest when we are positively working together. Our 18 month Graduate programme is designed to attract fresh talent into meaningful roles within Investment Banking, where you can contribute quickly, whilst undertaking training activities tailored to your needs. We are looking for highly motivated, dynamic individuals who will thrive in a demanding and exciting environment with support from industry experts and a dedicated Graduate Liaison Officer. Each year we assess our business needs and confirm areas where new Graduates will be best placed to develop into full-time roles with opportunities for progression. Following the successful completion of the programme, our Graduates become full time, permanent employees of the firm. Please visit our Company website https://www.uk.daiwacm.com/careers/graduate-training-programme to find out more and apply directly by completing our online application form.